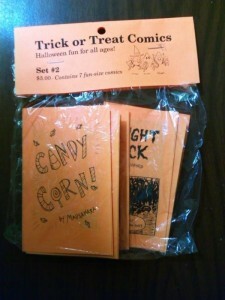 Our second annual set of Trick or Treat Comics is here: seven small (2.75″ x 4.25″) & spooky 8-page minicomics, perfect for handing out to trick-or-treaters or Halloween party-goers – or to keep for your crypt library! a multipack of three sets to hand out. As you may have noticed from the discreet link to the left, we now have a Facebook page you can “like” if you like that sort of thing. Thirsty for comics? WATER is here! 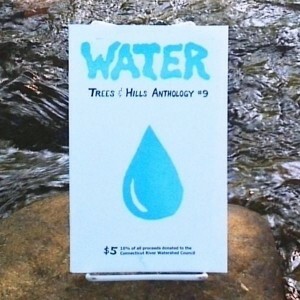 The new Trees & Hills anthology WATER debuted at MECAF a couple weeks ago, and now you can buy it online from our shop! You can see its hand-printed cover to the right there, looking cool in the Ashuelot River. WATER contains 56 pages about the Connecticut River, the Weeks Act, the Lake Champlain monster, a sad lamprey, the Nahr El Kalb Valley in Lebanon, Jenny Greenteeth, childhood summers at Laurel Lake, communities fighting water-bottling corporations, and more! Includes the last comics of Mark “Sparky” Whitcomb with an appreciation by Stephen R. Bissette. 10% of all proceeds go to the Connecticut River Watershed Council. WATER features the talents of Daniel Barlow, Marek Bennett, Stephen R. Bissette, Jesse DuRona, Glynnis Fawkes, Sam Leveillee, Matt Levin, Mike Lynch, Madsahara, Elizabeth Neronski, Colin Tedford, Anne Thalheimer, Mark “Sparky” Whitcomb, and Matt Young. 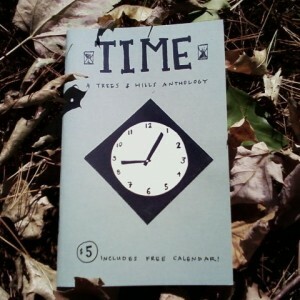 Behold, our latest anthology: TIME! 64 pages of comics about time, plus a comics-filled calendar, available now for online purchase. Also added to the shop: Matt Young’s The Good Catholic #2.5 and my own (Colin Tedford’s) Square Dance #4. Related to TIME, if you can’t make it to MICE or Greylock Arts this Saturday, you might check out Howard Mansfield reading from his new book Turn and Jump: How Time and Place Fell Apart, a series of essays in which he examines what time has meant to us in New England from the past to the present, at Toadstool Bookshop in Peterborough, NH at 11:00 AM. Buy SHELTER & preorder PLAY in our new shop! I’ve neglected our poor web shop basically since Seeds came out (busy, wanted to redesign it, etc.) – but no more! I’ve set up the shop on a new, easy to use platform and put up our anthologies and comics by myself, Colleen Frakes, and Sam Leveillee. In the coming week I’ll add comics by Marek Bennett, Anne Thalheimer, and others. Check it out! SHELTER! You can finally buy it online from us, not just from Microcosm! New printing of SEEDS released! SEEDS, the fan favorite Trees & Hills comics anthology about food, has been reprinted! This new edition of the 2008 anthology contains more than 50 pages of comics, a recipe book of cartoonists’ food favorites and a packet of organic seeds from a Vermont farm. It’s actually pretty much like the first edition – but that one sold out months ago! 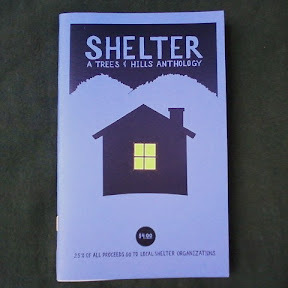 The $5 book is available through the Trees & Hills Distro and at comic conventions in New York City, Boston and Maine this spring. Microcosm Publishing has also sold out of SEEDS – the Trees & Hills comics anthology about food – and asked to reup their order. The original run sold out just shy of three months after we printed them. Microcosm had the last few dozen. We’re all out, but I think we’re reprinting later this month or early March, just in time for the spring con shows. Don’t miss it this time! 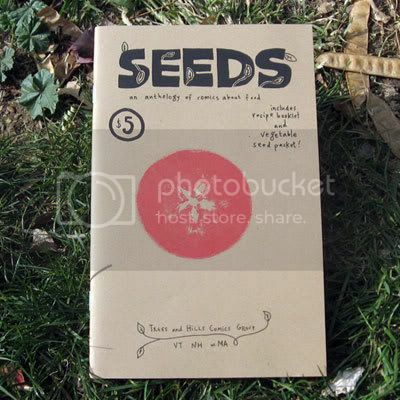 At long last, Seeds is in stock at our online shop! Themed around FOOD with an emphasis on its social aspects, the anthology comes with a booklet of cartoonists’ favorite recipes and a packet of organic lettuce seeds from High Mowing Farm in Vermont, all wrapped in an earthy brown cover with a red apple print (an organic heirloom apple from a local farmer’s market, of course). We’re especially proud of this one, and it has been selling like hotcakes (appropriately enough). We are pretty sure the initial printing will be sold out by year’s end (! ), so get your copy while the getting is good! Makes an excellent gift. The Trees & Hills Distro is back online! Sorry the renovations took so long; it wasn’t too much work, but some personal matters tore my attention away for a while. Anyway, now the world may once more purchase the minicomics of our fair region from one convenient online location. - A Store Finder listing shops that have been known to carry our work. - Comments – Post reviews of the minicomics! - Artist List in menu, so you can see who we stock & what we have by them more easily. - Individual product pages so you can link to a specific item you want to tell someone about instead of hoping they find it on the site. - Bigger cover images! Well, actually they’re still pretty small, but as I scan and upload new comics, you’ll be able to click the thumbnail for a larger view. The distro’s website has lagged behind what we actually have in stock for some time, but now those items are finally finding their way to the site. The first “new” items in stock are Booty #20 by Anne Thalheimer and A Taste Of Paradise by Megan Baehr. Yay! More comics will be joining the online stock in the weeks to come. You may notice that some items are marked “out of stock” – why the heck did I bother posting them? Well, after I got the site back up, Hub Comics in Somerville, MA (“the comics shop for NPR listeners”) ordered a bunch of minis! Which caused some things to run out, and made me realize some thing were already gone (whoops!). Anyway, if you live near Somerville, definitely check out Hub Comics, because they clearly love good comics. Thanks, Hub! The main site here is next up for an overhaul. I’m planning to take a single day to do most of the work, though, so it shouldn’t be a lingering process. NEW STARS available in the shop!